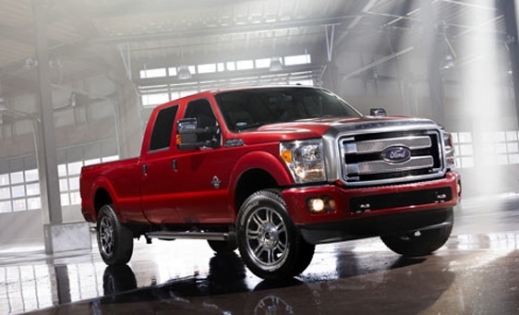 From its bold mesh-detailed grille to its exclusive satin-chrome tailgate applique, the new 2013 Ford Super Duty Platinum clearly communicates your hardworking ethic and recognizes your platinum level of success. Inside, Crew Cab spaciousness combines with unique premium leather-trimmed seating to give this Built Ford Tough truck an unprecedented level of sophistication. Available in the Super Duty Crew Cab, it can be ordered as an F-250, F-350 or F-450 and with the 6.7-liter Power Stroke® diesel engine or the 6.2-liter V8 gas engine. The Super Duty Platinum clearly stands out, thanks to its unique satin chrome grille surround, 20-inch cast-aluminum wheels with unique painted pockets, a monochromatic bumper and chrome tow hooks. In fact, chrome is king – the door and tailgate handles, mirror caps, running boards, exhaust tip and the Platinum name on the boxside feature it. Inside, meanwhile, there are special woodgrain appliqués, and a unique heated steering wheel with genuine walnut swirl wood and leather trim. Brown Oliver Ash woodgrain appliqué appears on the instrument panel end caps, center stack and door trims. And a new storage area atop the dash has a USB port, audio-visual connections and a 12-volt charging port for your cell or other digital devices. 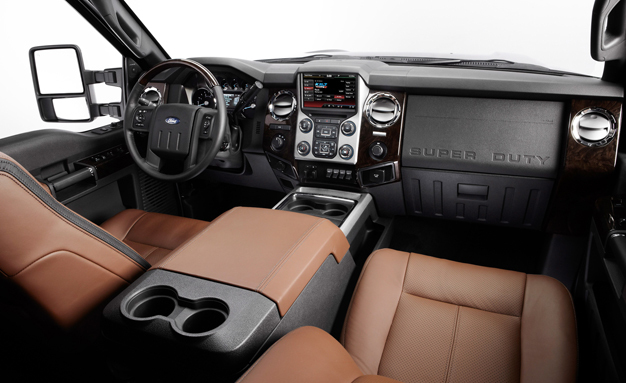 The voice-controlled MyFord Touch® connectivity system makes its first appearance on the Super Duty, and just for the F-Series, Ford designers have optimized the physical interface for MyFord Touch to accommodate truck users who may be wearing work gloves, by providing easy access to climate controls and audio presets on the center stack. MyFord Touch is standard equipment along with navigation, power-adjustable pedals, a rearview camera, Remote Start System, a universal garage door opener and power-telescoping mirrors. Available exterior colors are Ruby Red, Kodiak Brown, Tuxedo Black, Ingot Silver and White Platinum, while interior colors include Pecan and Midnight Black. The 2013 Ford Super Duty Platinum will be available later this year and we will let you know right away when we get them on our lot.